Taking Genre Fiction and New Pulp to another level, Pro Se Productions debuted the Pro Se Single Shot Signature line of digital series and writer’s imprints in mid 2014. The innovative Publisher now welcomes another genre to the prestigious digital line written by one of the leading voices in Cosmic Pulp Fiction. Alpha/Omega by Van Allen Plexico debuts with its first episode-Hostile Takeover- for only 99 cents. 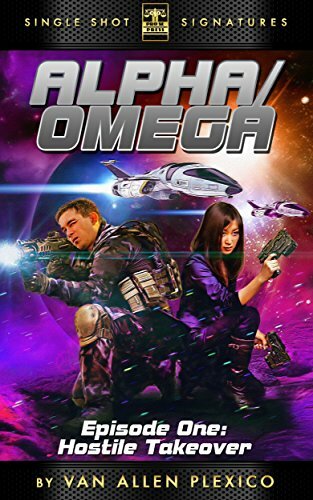 Alpha/Omega: A new serialized near-future space opera adventure from Van Allen Plexico, author of the Shattering and the Sentinels series. Episode One: Hostile Takeover! Alpha/Omega Book One: Hostile Takeover features stunning cover art and logo design by Jeff Hayes and eBook formatting by Russ Anderson. The first issue of the latest Pro Se Single Shot Signature Series is available for the Kindle via Amazon at http://tinyurl.com/phxczzw and for most eBook formats at www.smashwords.com for only 99 cents.